This focus of this audit is strictly on the event websites: how they promote and integrate social media on the website. Throughout the season we tracked each of the event’s websites during their week of play, and we rechecked our findings on September 25-26, 2013. The tour event websites combined for a total of 90 official channel integrations. Interesting to note that from the PGA’s schedule for the Majors they link to the PGA’s own template event sites, and not the official websites. The template does not include any social integration. 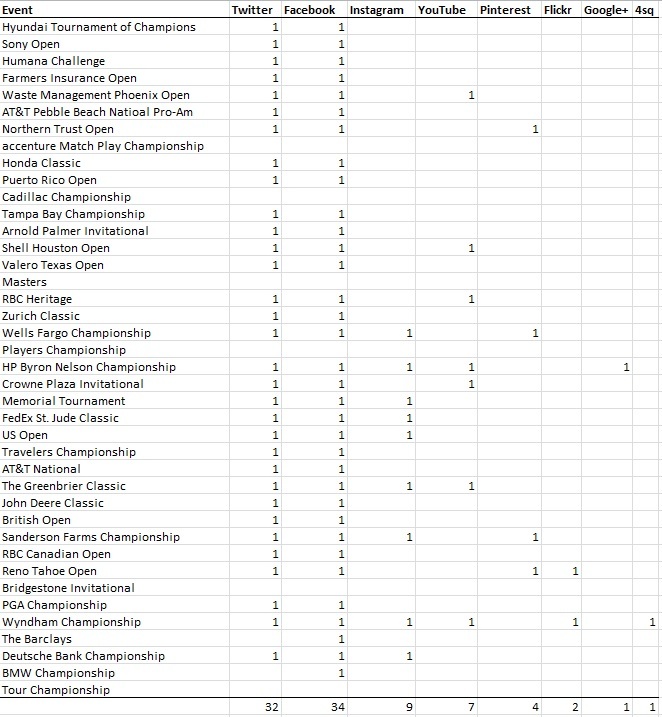 In reviewing the sites, a lot of events integrate individual videos from the PGA Tour account so that may be the best strategy for events if they don’t have the manpower to do original video content and properly manage a dedicated channel (only 7 events have a dedicated channel). 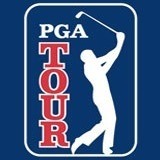 Our recommendation would be to still setup a dedicated event channel and use the PGA Tour videos via a playlist. Only 29 of the 40 events included universal icons. Includes “Stay Connected” text link in the header that opens a pop-up box with icon links, but there’s no real call to action to it, and why make fans click to see your social channel icon links? Recently added Instagram link to the SM icon links, but the account shows 9 photos posted on July 25th. Their event took place Jan 31 – Feb 3??? Last Pin posted was 31 weeks ago. Two boards have no pins, and one has one pin. Random “Saturday” board has 3 pin. Under the site’s main nav “Media” section, they include a Facebook icon link for Photo Albums – first time we’ve seen this strategy on an event or team website. Last photo was May 5th of the trophy asking who will take it home, but no winner photo? The Players also uses on the PGA template website format, and here’s a review we did in May on the event’s social efforts. The Byron Nelson is the only event to promote a Google+ account. They’ve made no posts since May 15th (ie nothing during or after the event). Via the PGA Tour + account they did have the Tournament Director do a hangout on May 14th. Only event to have a social hub “Social Leaderboard” – only event to include a Field social directory, and promotes their sponsor with a dedicated feed. For more details check out this profile we posted in May. They did a good job cross-promoting their social efforts on Instagram – check out the previous British Open review for more details. Side-note: They have a YouTube account, but don’t promote the channel on their site other than an embedded video. They only have the one video upload so perhaps a wise decision to not call more attention to the channel until it’s more populated. One of two events that promote a Flickr channel, but they really shouldn’t get credit for it, because it hasn’t been updated since the 2011 event. Side-Note: They have their own YouTube channel, but the universal icon link goes to a search results page. They promote a Flickr account in their SM Directory, but it hasn’t been updated since 2011. Case for you using PGA Tour playlist – they uploaded a video to their YouTube channel one month ago, but prior to that most recent upload was 2 years ago. The site includes icon links for Pinterest and Linkedin, but they go to error pages.